Only two races today, the third stage of the Giro d'Italia and the second stage of the Tour of California. Apologies for the earlier erroneous listing of today's races. The coveted ‘Maglia Rosa’ has switched hands amongst Orica-GreenEDGE teammates as Michael Matthews sprinted to seventh place on the second stage of the Giro d’Italia in Genova today. Matthews will line up in pink as the race leader for tomorrow’s third stage, having finished ahead of 2014 Liege-Bastogne-Liege champion Simon Gerrans, who took first honours following yesterday’s team time trial victory. With just one category four climb over 50km from the finish, on paper the first road stage looked set for a bunch sprint. Five riders formed the move of the day in the opening kilometres of the 177km stage without any resistance from the peloton. At its greatest, the gap from Marco Frapporti (Androni-Sidermec), Lukasz Owsian (CCC Sprandi Polkowice), Giacomo Berlato (Nippo – Vini Fantini), Eugert Zhupa (Southeast) and Bert-Jan Lindeman (Team LottoNL-Jumbo) reached almost ten minutes. Orica-GreenEDGE took their position at the head of the peloton in defence of the pink jersey, later joined by the efforts of Tinkoff-Saxo. With 50km left to race, the gap was reduced to just three and a half minutes. With the break in sight the bunch began to get nervous resulting in a number of crashes. One involved Orica-GreenEDGE’s Michael Hepburn but he was able to remount and complete the stage. The break was reeled back in ahead of the start of the nine kilometre finishing lap, the peloton briefly split in two courtesy of one of the crashes. In the final kilometre, Matthews was brought up the front by Brett Lancaster but the pair were swept from behind, Elia Viviani (Team Sky) the day’s eventual winner. “It was a stressful day, it was a nervous day, it was always going to be on a city circuit final,” sport director Matthew White said. “All our guys are OK, Michael Hepburn was involved in a crash but it looks like nothing too dangerous and we still have the Maglia Rosa. Tomorrow’s stage three is a short 136km trip from Rapallo to Sestri Levante. The peloton will negotiate an early category three climb and then a category two with just over 40km to finish with a series of smaller ascents in between before a flat run in to the finish. Moreno Hofland nearly took the victory in the second stage of the Giro d’Italia today in Genoa. The young sprinter from Team LottoNL-Jumbo delivered a strong sprint, but was passed by Elia Viviani (Team Sky) just in time. Bert-Jan Lindeman was part of the early breakaway and grabbed the mountain jersey thanks to his effort. 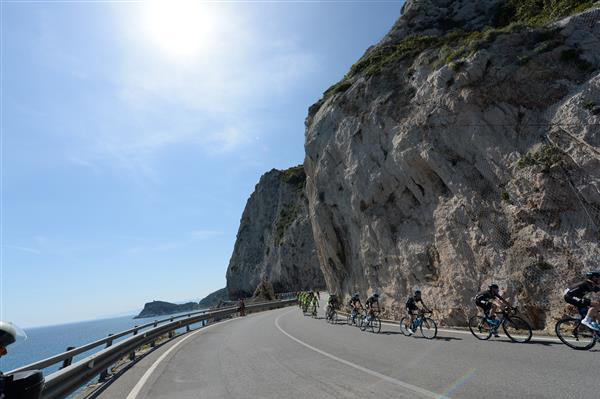 Today the second stage of the 98th Giro d’Italia took place, a sprint stage of 177 kilometres from Albenga to Genova. Immediately after the official start five riders escaped the peloton. With eleven kilometres left to cover, in the first local lap of 9.5 kilometres, they were all caught. At the end the spectators got to see the expected bunch sprint. André Greipel rode in first position in the last hectometres, which were slightly uphill. He was passed by Moreno Hofland and Elia Viviani, who won. Greipel finished on the third place. It was a beautiful day for a Giro stage, but André Greipel couldn't seal the deal for a stage win today. Roman Kreuziger and team captain Alberto Contador move to 5th and 6th place overall respectively after Tinkoff-Saxo with Chris Juul-Jensen spearheading the team had put in an effort at the front of the pack during the majority of the day. Stage 2 of Giro d'Italia eventually finished in a bunch sprint, where Elia Viviani took the win after several crashes had marked the finale. After crossing the line safely, team leader Alberto Contador marked that the reason for positioning the team at the front was to minimize any risks. “Today the team worked very well with the objective of staying safe and avoiding any crashes. Today, the best for doing so was to ride at the front. On a stage like this it’s important not to get caught at the back or crash like we saw happening on the last part of the stage”, says Alberto Contador before adding about the stages to come. “Tomorrow is an important stage, it’s very short but with hilly terrain and a climb along the 136km route. We especially need to concentrate in the first 90km and control the race, and then maybe someone can attack. In the Giro you can lose everything at any given moment and you have to be attentive. Right now everything is going well and I’m feeling good. We have to wait for the next stages to see how everything develops but at the moment everything is perfect”, underlines the team leader, who sits 6th in the GC, 7 seconds behind race leader Michael Matthews. 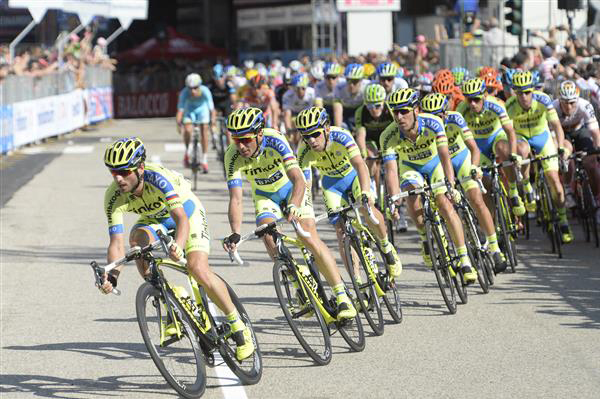 Tinkoff-Saxo worked the front today. Stage 2 from Albenga to Genova came after yesterday’s flat-out effort at the opening team time trial. And the peloton also allowed a breakaway to build a significant time advantage before Orica-GreenEdge and then Tinkoff-Saxo reeled in the escapees with around 15km to go. Tinkoff-Saxo left the front of the peloton and eased off as they went into the safe zone of the last three kilometers, where the sprinter’s teams took over. 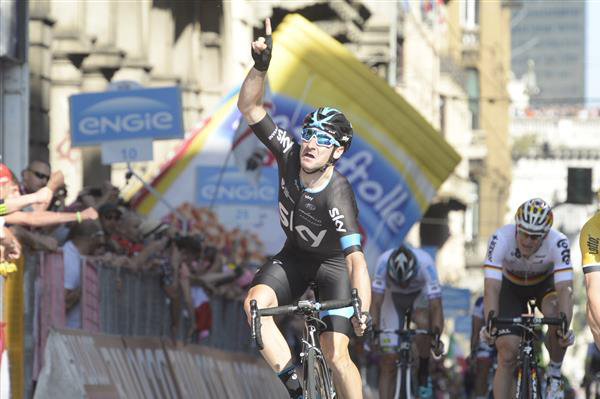 In the final sprint, Elia Viviani (SKY) proved the fastest. Despite the relatively flat stage profile, Tinkoff-Saxo’s sports director Steven de Jongh explains that stage 2 was no easy day. “Today, we chose to sit at the front until just before the finale. It was a hot day and the team delivered a solid performance, as the main goal was to cross the line without having had any disturbances. We succeeded in that, which is positive, as the first days of a grand tour are always tricky, a bit nervous and with crashes like we saw today. In general it was a day with a lot of up and down and left and right, which created some tension and made for a day that wasn’t easy. But the guys worked at the front until we were into the last three kilometers and we got through safely”, concludes Steven de Jongh. The wishes of Sacha Modolo of obtaining his first victory in the Giro d'Italia ended at 200 mt to the end of the 2nd stage of the Pink Race, the Albenga-Genova of 177 km. Exploiting the perfect support by Ferrari and Richeze in the approach to the sprint, Modolo on the light hill final straight (max gradient of 2%), Modolo appeared to be competitive enough to obtain a top result, but a contact at 200 mt to go with Nizzolo put the end to his ambitions. Sacha was forced to brake and so he gave up the sprint, while Viviani, who began the sprint on Modolo's wheel, went on and won the stage. The first blue-fuchsia-green rider who crossed the finish line was Richeze, 57th. Modolo explained that: "The arrival of the stage suited my characteristics, so I really wanted to be protagonist and to try to achieve my first win in the Pink Race. I thank Ferrari and Richeze, who were both amazing in preparing the sprint: Roberto accelerated before the last bend in order to strecht the head of the bunch, then Maximiliano raised the speed in order to launch my action. I felt like I had good legs, but I noticed that probably I had begun a little bit too early my sprint, so I tried to hesitate and fall back in with the sprinters that were coming from behind, but Nizzolo came in contact with me and I was forced to renounce my action". Before the bunch entered in the final circuit in Genova (2 laps, 9,5 km each), 5 riders breakaway had led the race. In Genova, two crashes broke the bunch and Niemiec and Ulissi were in the second group, even if they did not get involved in the incidents: they crossed the finish line 1'09" late. Sacramento, USA, 10 May 2015 - Velocio-SRAM's Trixi Worrack has claimed victory in an exciting final stage at the Amgen Tour of California Empowered with SRAM today in Sacramento. Worrack finished five seconds ahead of Leah Kirchmann (Optum p/b Kelly Benefits) and six seconds clear of Lauren Komanski (Twenty16 p/b Sho-Air). Going into the final stage, Worrack was three seconds behind overall leader Komanski. With several bonus seconds available on the 54 kilometre circuit race the team had the plan to go for the intermediate sprints. 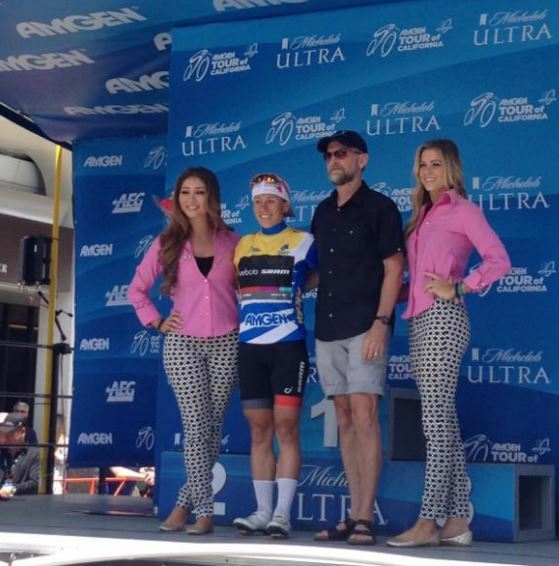 "My team did an amazing job in the lead outs for the bonus seconds. We knew that these bonus seconds were our best way to take the overall leaders jersey," said Worrack. "The team has been working so well together in Spring and I was confident that if we could do the same here in the final stage, then I would be able to take enough bonus seconds to win." The race was fast and furious with several teams invested in creating a breakaway group. With wide roads a fast pace and the strength of Velocio-SRAM there were no moves that were allowed to stay away. The lead out from Velocio-SRAM was unstoppable and Worrack won all three intermediate sprints, catapulting her to six seconds ahead of Komanski in the overall classification. The final stage was won by Kirchmann while Worrack's fourth position allowed her to seal the victory. Team Director Sportif Beth Duryea said the tour had been a great success. "We were excited to bring our team to USA and to race the first women's edition of Amgen Tour of California Empowered with SRAM. SRAM are one of our major sponsors and their support for our team and women's cycling is incredible. We're pleased to be able to reward our sponsors with a win in such an important and high profile race." The next race for Velocio-SRAM is the 2015 Women's Amgen Tour of California Invitational Time Trial on May 15 at Big Bear Lake, California. Sacramento, California - BMC Racing Team's Jempy Drucker finished third behind stage winner Mark Cavendish (Etixx-Quick Step) and runner-up Peter Sagan (Tinkoff-Saxo) in Sunday's opening stage of the Amgen Tour of California. Drucker's result was a season-best in his first time racing in the United States since turning professional in 2011. "I am very happy and very satisfied," Drucker said. "The team had confidence in me and I gave them back with a result. I am maybe not the fastest sprinter, but I can still do some good placement and get some good results. So I will try to be up there again tomorrow." "Daniel kept me out of trouble and out of the wind and he is always good in front, like Danilo (Wyss) and Joey (Rosskopf)," Drucker said. "But for me, it was too early to be in his wheel. So I let him go and I let the Etixx-Quick Step guys close the gap. I was in good position and it was a high-speed sprint, so I was difficult to move up. But if you already in front, it is even easier to do a good result." BMC Racing Team Sport Director Jackson Stewart said Drucker's result was better than anticipated. "We were not expecting a podium, but it is really nice to see to see Jempy sprint that well," Stewart said. "With this level of field, Jempy was really good by himself at staying in position. He knows the teams that are going to control and he was just watching to be there. He doesn't need a whole train to lead him out because he is not a pure sprinter." The BMC Racing Team's protected rider for the overall standings, Ben Hermans, finished 16th and in the same time as the stage winner. 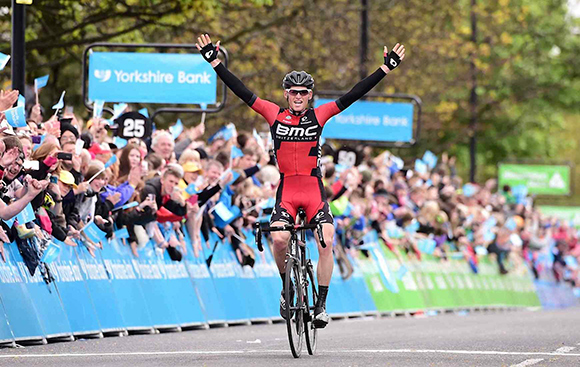 Ben Hermans wins stage 3 of the 2015 Tour de Yorkshire. The traditional final stage of Four days at Dunkerque on the northern French coastline by The English Channel was dominated by a breakaway including Cult Energy Pro Cycling’s Christian Mager and Europcar’s Thomas Voeckler but in spite of a strong effort, it all came down to a bunch sprint. The breakaway of six riders was being chased by the field animated by the French sprinter teams while Cult Energy Pro Cycling concentrated on protecting Mads Pedersen and Russell Downing in the peloton. With 18 kilometers to go, the escapees started attacking each other, which immediately and significantly brought down the gap and only 8 kilometers later, Mager and Voeckler were swept up by the speeding peloton. The last standing escapee, Benoit Jarrier (Bretagne) kept on pushing on the front but had to forfeit with 6 kilometers to go. From then on, it was a landrush towards the finish line where Edward Theuns (Topsport Vlaanderens) took the stage in a wild bunch sprint. 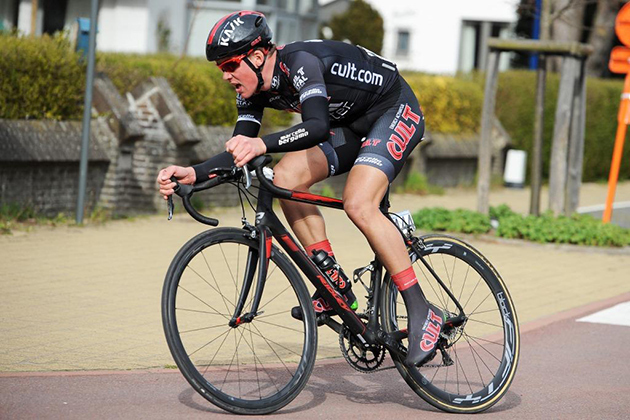 Cult Energy Pro Cycling’s Russell Downing finished 7th while teammate, Mads Pedersen took 6th overall. DS, Michael Skelde says: "I really wanted us to represented in today's breakaway. Especially on the final stage here in Dunkerque, escapees have a good chance of making it to the finish line but even though we came close today with Christian, it was a good effort. Naturally, I'm content with the overall result but I'm also happy to see how we influence the race on each stage." Mads Pedersen adds: "I wanted to secure my overall position and at the same time give someting back to the guys who have protected me all week so Russell was our man for the sprint today. But still I was well-protected in the finale and had no problem sailing in across the finish line with what I consider a great personal result. It provides a load of confidence for the coming races and it only confirms that I've been preparing well for this race." Mads Pedersen's next race is the Dutch stage race, World Ports Classic.